The program has been credited for helping to reduce suspension and expulsion rates in the district. Community-building circles encourage respect and healthy relationships. Kusum Crimmel is notorious for making her students cry — a fact she's proud of. 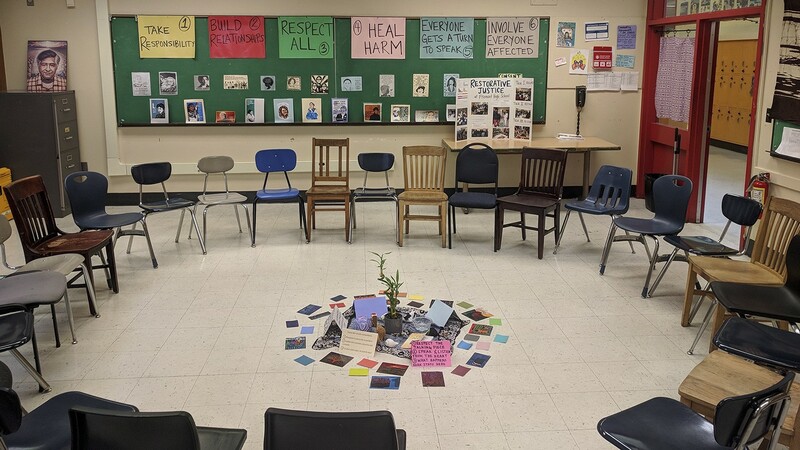 In a small room tucked behind the library at Oakland Technical High School, Crimmel has her students sit in a circle and pass around a "talking stick" as they answer questions and share experiences. The circle is a staple of the class. It's meant to build trust and respect among students. And often, by the end of the semester, they'll cry, she said with a smile on her face. For Crimmel, this shows that her students feel safe enough to be vulnerable with one another. She said it's evidence of the culture shift that restorative justice has brought to the school. Crimmel teaches a class called "Civic Engagement, Social Movement." The class, now in its third year at Oakland Tech, grew out of the Restorative Justice program in the Oakland Unified School District (OUSD). Since its inception in 2006, the program has grown to almost every middle and high school in the district, along with a few elementary schools. Many credit the program with lowering suspension and expulsion rates in the district. But school officials and teachers are worried that the most recent district budget cuts will hurt the program, curtailing years of hard work. In December 2017, OUSD voted on a $9 million mid-year budget cut, and the district must slash another $10 million for next year's budget, according to district reports. David Yusem, coordinator for the Restorative Justice program for OUSD, said he had to lay off seven people from his 35-member staff, and he expects the number of schools that participate in the program to decrease. While he said he may rescind some of these layoffs before the school year starts, when the budget is fully in place, he's not sure exactly how many yet. "We're still in that space of waiting for the money to land," he said. Regardless, Yusem said the cuts will likely hamper the program, which has become a vital part of changing the punitive culture inside Oakland schools. "The initiative itself is definitely part of the culture of our school district," he said. "It's absolutely vital." He said this culture change has been necessary for the success of some of the most vulnerable students in the district. It's imperative, he said, to transform the way public education has dealt with discipline, which he feels has pushed African American and Latino students into the criminal justice system. Restorative justice focuses on repairing harm and rebuilding community rather than punitive discipline measures such as suspensions and expulsions. The Oakland program is built on a three-tier system: community-building circles, like those in Crimmel's class, which encourage respect and healthy relationships; the restorative process, which involves students who have harmed each other in order to repair their relationship and hold them accountable; and circles to support students who are re-entering the school system after suspension, expulsion, or incarceration. As the on-site restorative justice facilitator at Oakland Tech, Crimmel is tasked with leading circles at every tier. She also trains students to lead them. The main idea behind each tier is to build a community of strong and caring relationships. "If we build a strong community within ourselves, we're less likely to harm each other," she said. "We're more likely to want to understand where people are coming from." The Restorative Justice program at OUSD started in 2007 at Cole Middle School in West Oakland as a partnership with Restorative Justice for Oakland Youth, a nonprofit working to implement restorative justice programs among students. The pilot program resulted in an 87 percent decrease in suspensions and zero expulsions at the school, according to a 2010 study by UC Berkeley's School of Law. In 2010, OUSD implemented a district-wide restorative justice program, as part of an agreement with the U.S. Department of Education's Office for Civil Rights, to reduce suspensions for African American students. At the time, they were working on a "shoestring budget," piecing together funds from the city and state along with other foundation grants, according to Yusem. In 2011, only two schools in OUSD had a restorative justice program. Yusem and a small team of contractors would go into a school and establish a restorative justice model by training students and teachers. Then, three years ago, the program received district funding for the first time. With $1 million, the program hired 30 site-based facilitators as well as four program managers, which allowed facilitators like Crimmel to build up restorative justice programs to a whole school level. This past year, the budget for the program grew to $2.5 million. Now, more than 20 elementary, middle, and high schools in OUSD have a full-time, site-based facilitator. Yusem expects that number to drop in the next year. In order for a school to have a facilitator at its site, it must provide a certain amount of funding, which varies depending on that school's finances. The Restorative Justice central office then matches that amount. But, Yusem explained, if the school doesn't provide that funding, the central office can't afford to place a facilitator at the school. OUSD School Board Director Nina Senn, who has been a champion of restorative justice throughout her career at OUSD, said that without facilitators, it will be harder for faculty and administrators to maintain the momentum of the program. "It may be that the school sites need to do more of their own work," she said. "Given all the demands on time on the administration and staff, that's harder." Ron Towns is a sixth-grade teacher Gateway Public Schools in San Francisco and cofounder of Camp Common Ground, an Oakland-based summer camp that teaches students to fight economic and racial segregation and uses restorative justice practices. Towns said restorative justice practices can be time-consuming, and teachers often don't have the resources to do it properly. When it comes to discipline in schools, Towns says that schools must work to be clear, consistent, and fair. One area for growth is family communication about how to discipline children. "Why are you coming in and saying this is the way you're going to do things when that may be a mismatch with what kids are used to culturally?" he said. He added that teachers need to work on "cultural competency" in order for restorative justice circles to be effective. That means reaching out to parents and asking them not only how they discipline their kids, but what works best for each child. Senn isn't worried about a clash between parents and students. She sees the program as an alternative for families. "We can give our families the opportunity to think about how it's used in their family circle," she said. Since 2011, the number of suspensions in OUSD has dropped significantly. During the 2011-12 school year, 7.4 percent of students were suspended. This past school year, that number decreased to 3.3 percent. Senn and Yusem are wary of attributing the drop solely to the restorative justice program, noting other initiatives in the district, including the Office of African American Male Achievement, which began in 2010 to curb suspensions and expulsions among those students, and the Office of Equity, which launched in 2016. Senn and Yusem do agree that the Restorative Justice program has created a positive culture shift. "They feel emotionally safer," Senn said about students. "They feel like they can share their opinion without having any negative repercussions." Editor's note: A previous version of this story mischaracterized the comments by Ron Towns; he was speaking about restorative justice and discipline practices generally and not those at OUSD. Additionally, he has never worked at OUSD schools. This version has been updated.